The Amalfi Coast is without a doubt the most spectacular and beautiful coastline in Italy. Moorish style villages cling to the dramatic jagged cliffs, perched over the rippling waves below. The air is scented with lemons and wild herbs, and of course the sea. The villages that string along the Amalfi Coast have cobblestoned streets lined with bougainvillea-covered villas, Arabic arches, and countless corners with million dollar views. The magic of the “Costa Amalfitana” is that while it is a magnet for jet-setters and home to a multitude of ultra-luxury five-star hotels, Michelin starred restaurants and yachts, what characterizes the region is its effortless Mediterranean simplicity. Your base for this unforgettable luxury tour will be at a romantic small hotel in Positano. The hotel dates back to the 18th century and is full of striking antiques and oil paintings. Its restaurant is magnificent at night as musicians play mandolins discreetly and hundreds of candles flicker over the dining terrace. Food and wine are highlights of the Amalfi Coast, and always a focus on our tours. Fresh seafood, juicy vegetables drizzled in olive oil, aromatic local wines – this is the “materia prima” or raw material that the region is rightly famous for. Local gastronomic gems include creamy Mozzarella di Bufala, Limoncello made with ripe Sorrento lemons, and San Marzano tomatoes (known all over the world). Traditional dishes are simple and delicious such as Gnocchi alla Sorrentina (with tomato and basil), ‘Impepata di cozze (spicy mussels) and the delicious Spaghetti alle vongole con pomodoro (spaghetti with clams and tomatoes). Vineyards are scattered through the sun-baked coast and inland in the Sorrento Peninsula and greater Campania. Grapes were brought to Campania by the Ancient Greeks and fabulous wines are being made by cult producers with such noble grapes as the white Falanghina grape and the black Aglianico (which actually means “Hellenic”). 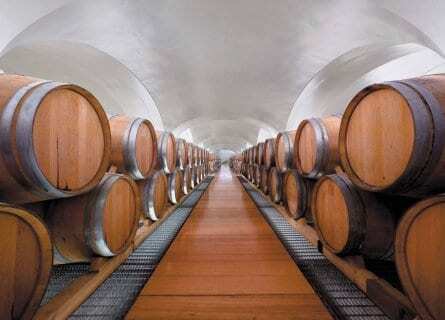 On this tour, you will visit some top wineries such as Feudi di San Gregorio and Marisa Cuomo’s wonderful Gran Furor. 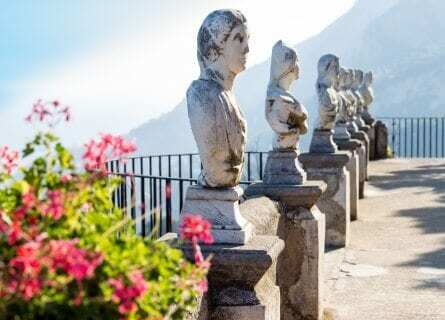 Other highlights of this tour include lunch overlooking the sparkling sea in Ravello, a private boat tour to Capri, and dinner at Don Alfonso, one of the best restaurants in Italy. If you want to splurge on this trip of a lifetime either for a special occasion or pure indulgence, contact us for more information on this tour! Upon arrival at Naples airport in the morning, your elegant and friendly private chauffeur and Mercedes will meet you in arrivals. Your next stop: wine country! You will transfer to Sorbo Serpico (about a one hour drive) and visit the exclusive winery Feudi di San Gregorio winery. This estate is considered to be one of the best in Southern Italy. The spectacular wine cellar was designed by Japanese architect Hikaru Mori and was a whopping 25 million dollar investment for the company. The wines of Feudi are known for being concentrated and with finesse and after a private tour of the cellar you will taste six of the best wines such as their “Campanaro” made with the white Fiano di Avellino, “Cutizzi” (made with the white Greco di Tufo) and Serro Cielo (made with the white Falanghina). “Must taste” red wines at Feudi di San Gregorio include “Serpico” (flagship wine made with the inky and dense Aglianico) and Piano di Monte Vergine (a Taurasi DOCG Cru made with Aglianico). This is a major treat. Lunch is at the refined Marennà restaurant, whose consulting chef is 3 Michelin starred Heinz Beck of Rome’s La Pergola. This will be a leisurely and relaxing wine lunch! Next stop, the Amalfi Coast, about a one hour and 45-minute drive. Arrive in beautiful Positano to your ultra-luxury hotel with spectacular views. Free evening to dine at the romantic restaurant at your hotel (highly recommended). Enjoy a late start today to take in your beautiful surroundings. In the late morning, you will head to the nearby Marisa Cuomo Gran Furor winery, a twenty-minute beautiful drive. You will enjoy a private visit to this highly esteemed estate and of course a tasting of the best wines such as the wonderful Fiorduva. Made with the interesting local grape varietals Fenile and Ginestra, this is a delicious white wine with apricot and orange blossom nuances. It’s also a winner of the extremely prestigious Tre Bicchieri (“Three Glasses”) Gambero Rosso award. Lunch will follow in beautiful Ravello at a top restaurant serving traditional cuisine with tables overlooking the dramatic sea. The restaurant has its own organic garden stretched out over the sloping gardens below. After lunch visit the Villa Cimbrone, with its historic cloister and magnificent views over the coast. Carry on to Amalfi village known for its exquisite tile work and gorgeous cathedral. In the late afternoon, you will head back to Positano and enjoy free time to relax, go for a walk, or do some shopping at the elegant boutiques. 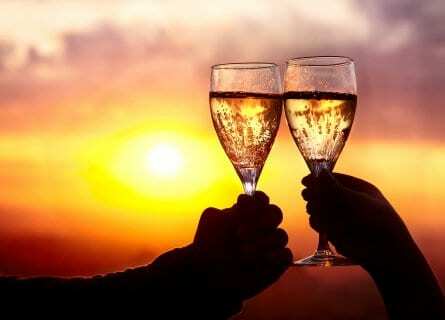 The evening is yours to dine on your own at the hotel or other ristoranti in town. Enjoy breakfast at your luxurious hotel, overlooking the sea. 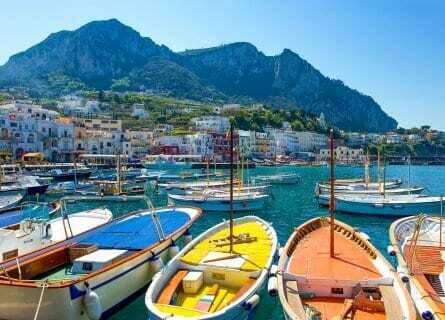 Today you will have a private boat tour to the one and only island of Capri. Visit the ethereal Blue Grotto and with your private captain, take in the stunning coastline around Capri. Once on land, enjoy a free day on your own. The Roman Emperor Augustus Caesar (Octavian) famously called Capri “La Città del dolce far niente”. This is a pleasure island to eat, drink, and people watch. You can also enjoy gorgeous walks in the island, Capri has some of the most diverse and lush wild flowers in the entire south of Italy. For lunch, try La Capannina close to the Piazzetta, with its charming wine bar and gourmet deli just next door. In the afternoon, you could take a walk up into Anacapri at the top of the island to see the gorgeous Villa San Michele and the dizzying views below. In the late afternoon, your captain will take you back to Positano. Enjoy some free time to freshen up before dinner. Tonight is a gastronomic highlight of your luxurious break- dinner at the Ultra Gourmet Don Alfonso 1890. This is one of Italy’s finest restaurants and is equally well known for its simply stunning wine cellar carved into natural tufo (which you will visit!) Don Alfonso has its own farm and all of the vegetables, fresh herbs, and olive oil come right from their farm to your table. The cuisine is based in tradition but with innovative and creative flair and presentation. A chef’s tasting menu of various courses and paired wines is in store. After your farewell dinner, your private chauffeured Mercedes will take you back to the hotel for you to enjoy your last night. Today at your preferred time, you will be transferred to Naples airport (or other port of call). If time permits, we can organize additional activities such as private cooking classes, more wine tasting, an archeological gourmet tour and much more. We hope you have had a marvelous stay and look forward to seeing you again! Relais Blu was very very nice, no complaints! Il Riccio in Capri was better than perfect, we had fun with the Sommelier, the food was top notch and they were very accommodating with the food. Vigne di Raito – again, better than perfect. Everything about the meal, setting, conversation, etc was amazing. Visiting Patrizia was such great fun! Driver Frank was always punctual, helpful, never flustered with traffic, and a most polished driver. We LOVED the boat trip, it was great. Francesco was very polite and accommodating – we enjoyed many swim stops. The Limoncello tasting was fun, we really enjoyed it. Pompeii was good, very hot! Great trip for sure, the trip to Capri with the wine tasting and lunch at Il Riccio was a highlight for Joe and me. The tour was well organized and implemented. We enjoyed Feudi Di San Gregorio, but that was primarily because of the spectacular meal. The winery building and grounds are very striking and beautiful. The gardens are magnificent. All of that was a fabulous visual experience. Each part of the multi-course gourmet extravaganza was perfect. One of our family members doesn’t eat meat, and the chef and servers adjusted her courses accordingly (and hers were every bit as wonderful as ours). The meal and wines were beyond compare! Thank you once again, and we will definitely come back to Cellar Tours when we travel in the countries you handle.